ArborCare Tree Service takes the threat of disease very seriously. 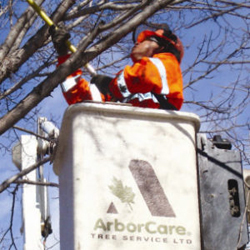 We provide extensive Tree Disease Treatment to clients across Western Canada, including Calgary, Edmonton, Vernon & Kelowna. If your trees or shrubs are exhibiting signs of sickness, blight or disease, it’s important to act quickly to ensure that the problem is contained. Many diseases are actually caused by attacking fungi, including Black Knot disease, Septoria canker, Cytospora and more. A tree that has been weakened by drought or oxygen starvation can be especially susceptible to disease, which is why it’s important to take good care of your trees through proper pruning and care. For other diseases, such as juniper-hawthorn rust, control of the disease requires separation of the fungus from the host and the removal of galls. Each fungus and disease is unique, which is why it is crucial to call in a company with the experience to recognize the disease at hand and treat it appropriately. More specific information can be found on the dedicated pages on our website. To find out more about diseases, or to get started with our services, contact us today.